Rock and slag insulations, sometimes referred to as mineral wool, have been produced naturally for centuries. During volcanic eruptions, when a strong wind passes over a stream of molten lava, the lava is blown into fine silky threads that look like wool. From this natural inspiration sprang one of the most innovative and versatile insulation products on the market today. Today’s rock and slag wool insulations are high-tech versions of their predecessors, produced from plentiful basalt and industrial slag. Rock wool and slag wool insulations are composed of basically the same raw materials in different proportions and are produced in the same way. Manufacturers use a mechanized process to spin a molten composition of rock and slag into high temperature-resistant fibers. Their similar properties also produce fairly similar performance attributes. The major difference is in the specific volumes of the various raw materials used to make each product. and limestone or dolomite. Slag is a byproduct from steel production that would otherwise wind up in landfills. Binders may be used, depending on the product. Typically, rock wool insulation is composed of a minimum of 70 to 75 percent natural rock. The remaining volume of raw material is blast furnace slag. Slag wool insulation is composed principally of fibers manufactured by melting the primary component, blast furnace slag, with a combination of some natural rock, with or without binders, depending on the product. Typically, slag wool insulation uses approximately 70 percent blast furnace slag, with the remaining volume of raw materials being natural rock. Thermal performance. Rock and slag wool insulations are tested to all applicable industry standards to ensure their R-value does not deteriorate over time. Loose-fill rock and slag wool insulations resist settling, and batt products spring back after average compression, so installed thermal performance is maintained over the life of the product. Fire resistance. Rock and slag wool insulations are naturally non-combustible and remain so for the life of the product. These insulations can resist temperatures in excess of 2,000°F. 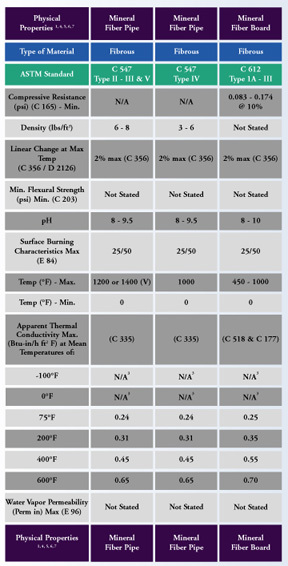 Because these products have a high melting temperature, they can be used in a wide variety of applications that call for these unique properties. These products meet NFPA 220and American Society for Testing and Materials (ASTM) E136 standards and test methods, and are Class A product tested per ASTM E84 and NFPA 101. Rock and slag wool insulations are used as passive fire protection in many buildings. Sound absorption. The fibrous structure and high density of rock and slag wool insulations offer excellent sound absorption properties, making these products an outstanding part of systems designed to reduce sound transmission. Mold, fungi, and bacteria resistant. Rock and slag wool insulations resist the growth of mold, fungi, and bacteria because they are inorganic. The fibrous composition of rock and slag wool insulations provides a flexibility and versatility not found in most other insulations. Rock and slag wool insulations come in a wide variety of forms, shapes, and sizes, including board, batt, loose-fill, spray-applied, and pipe insulation for many common and specialized applications. One of the most important environmental benefits of rock wool and slag wool insulations is their ability to make buildings and equipment more energy efficient. A thermally efficient building or system reduces the amount of energy required to maintain it. Slag wool is made from blast furnace slag, a waste byproduct of steel production. The industry estimates that over 90 percent of the slag used for insulation is purchased directly from steel manufacturers. The remaining 10 percent is mined from waste disposal sites and landfills. Between 1992 and 2005, slag wool insulation manufacturers used over 13 billion pounds of waste blast furnace slag in the production of insulation. Readers who are interested in learning more about the insulation material featured here should visit the MTL Product Catalog at www.insulation.org/MTL or visit the NIA Membership Directory at www.insulation.org/membership to fid a manufacturer. NIA Members who would like to author a future Insulation Materials column should contact publications@insulation.org.